William Merritt Chase was one of the earliest American artists to incorporate Impressionism into his work. His series on the Prospect Park in Brooklyn, which he painted and exhibited in 1886, exemplifies his Impressionist style. Here, Chase depicts his future wife sitting in a row boat in a small lake. There is a sense of ease as she strikes a contemplative pose. The park offered a convenient spot to paint en plein air, following the example of the French. Furthermore, as a natural space engineered by people in the midst of an urban environment, the park provided the perfect backdrop for Chase's vision of upper class leisure and genteel interaction with light and nature. Prospect Park was also an answer to the sophisticated spaces of European capitals, arguing that American cities had evolved to include such cultural considerations. The painting demonstrates the broad brushstrokes and interest in the play of light that are characteristic of Impressionist art, however, Chase's palette is notably more muted than most of French Impressionist painting. This might reflect his training in Munich (which he chose over studying in Paris). When he returned to America from Germany, he established an elaborately decorated studio in the Tenth Street Studio, the first building in New York designed as an artist space. He also began teaching at the newly formed Art Students League, making him a highly visible and influential central figure in American artistic circles. In the 1880s, he turned towards Impressionism, inspired by Whistler and Manet's loose brushwork along with a deep admiration for the work of John Singer Sargent, a lifelong friend after they met in 1881. His popularity among the social elite of Long Island, where he directed the Shinnecock Hills Summer School of Art helped to establish Impressionism as a collectable new school. John Singer Sargent was not a fully-fledged American Impressionist, but he had an important impact on the development of the movement as a conduit of new ideas from Paris to friends and colleagues in the states. His own style mixed elements of Impressionism with more traditional, academic portraiture. In this painting, Sargent depicts his friend, the French artist Paul Helleu, painting outdoors with his wife. In this work, art critics Helene Barbara Weinberg, Doreen Bolger and David Park Curry argue that Sargent "revealed a great deal both about the practice and the purpose of the new movement in landscape painting as it would emerge in the United States. Landscape painting (not just the more common landscape drawing) has been brought outdoors, a point made forcefully by the artist's canvas shown resting directly on the ground, in the midst of the subject he is depicting, and by the presence of his brushes and portable palette. Sargent, already a well-known portraitist, depicts his model, an academically trained figure painter who usually works in the studio, embracing the plein air method and the commitment to direct observation that recently had become mainstays of his own work." Sargent represents a seemingly unremarkable couple. The man paints professionally, but here he appears reclined in the grass, accompanied by his wife. Its ordinariness is key to its modernity, as Sargent rejects the need for a narrative. Without the title, the subject would only be recognizable to a small circle of friends and colleagues. The couple is viewed slightly from above, enclosing them in a natural space, but one that feels hospitable and comfortable. Sitting next to a small boat, they are day-trippers, enjoying a moment of leisure; their stylish clothing reveals that they are undoubtedly urban sophisticates, escaping to the fresh air of the countryside for a brief respite. The viewer can't see what Helleu is painting; instead, the focus is on the figures and their immersion in nature. Notably, the couple's faces are detailed more carefully than the rest of the picture, creating a contrast with the looser brushwork of the grass and canoe. This speaks to Sargent's stylistic balance between academic and Impressionist approaches, which would influence other American artists. Although she developed her painterly style in tandem with artists such as Degas and Camille Pissarro, Cassatt's position as both a woman and an American positioned her as an outsider. While she was not quite as restricted by her gender as was her French-born colleague, Berthe Morisot, Cassatt tended to represent feminine subjects and domestic interiors. Unable to visit the racecourses, dance academies and cafes favored by her male counterparts, Cassatt painted the spaces and scenes she had easy access to among her acquaintances. Although Cassatt spent two years at the Pennsylvania Academy of Fine Arts, her work was most influenced by her time in Europe. She studied academic art with Jean-Léon Gérôme in Paris during the 1860s, but when she returned to France in 1874, she became closely connected to the French group and showed her work with them on several occasions. Notably, Cassatt's work was also featured in the first major exhibition of French Impressionist work in the US, cementing her position as an artist who provided a bridge between French and American Impressionism. Cassatt frequently painted images of mothers with their children, a subject that was often understood as a secular version of religious images featuring the Virgin Mary with the Christ child. Rather than monumentalizing her figures, however, Cassatt emphasizes the domestic qualities of each scene. Take, for example, the large expanse of the foreground that is occupied by the comfortable chair in which the mother sits. Although the room is actually fairly sparsely furnished, Cassatt's presentation of the chair and water pitcher create the impression of a comfortable bourgeois home, and particularly of a uniquely female space which is used to look after children. This painting is striking partly because the woman is looking away from the viewer. This both makes the woman anonymous and gives the impression that the mother and child inhabit a private and intimate space that cannot be shared by the viewer. Cassatt offered American Impressionists a model for painting calm scenes of domestic tranquillity, a key subject matter for the group. A quiet image of simple domesticity, Tarbell captures a fashionable young woman preparing for an afternoon at the theatre. Although it appears to be a casual scene, Tarbell carefully arranged his paintings, often selecting precise accessories and furnishings that marked the space as specifically American. This young woman is unmistakably contemporary, as we can see from her clothing and hairstyle, yet Tarbell gives it a sense of timeless beauty through the glowing light and delicate palette of pastels. Tarbell was active in Boston, where he was part of a circle of painters who combined Impressionism with more traditional styles of painting and finish. This work combines the looseness of Impressionism with his deep respect for the example of Jan Vermeer, a Dutch Baroque painter who specialized in warmly lit interior scenes. Vermeer's paintings often followed a compositional formula, featuring a hidden light source and close attention to texture, which we see Tarbell emulate. Indeed, the influence of Vermeer is made visible by the cropped quotation of one of his paintings, The Music Lesson, shown hanging in the upper right corner. Two weeks after that wedding, Robinson began painting this scene. It is a work that speaks to the strong influence of Monet both on his own work and on American Impressionism in general. Although the title The Wedding March might suggest a formal ceremony, the couple are depicted casually strolling down a village street. There is no pomp, just a natural image of people's lives. Still, the stylish formal dress of the two couples belies their sophisticated backgrounds; they are not simply villagers, but members of the upper-class. While certainly Robinson adopts the loose brushstroke of Impressionism, the greatest influence of Monet is in his treatment of the brilliant sunlight. With the sun nearly directly overhead, even the dark suits of the gentlemen and the shadows they cast are shades of purples and blues. The brightness both calls our attention to the translucent veil on Suzanne and blinds us to her face. When J. Alden Weir visited an 1877 exhibition of Impressionist painting, he was originally repulsed, commenting that it was "worse than the Chamber of Horrors." In time, however, he came to embrace the style. This painting captures many themes of French Impressionism, including the juxtaposition of new industrial structures with bucolic nature. The new bridge, painted a brilliant red, is mirrored in the running water below to create a doubling effect. Weir was rare among the American Impressionists in showing an interest in industrialization. While many of his colleagues chose to feature carefully crafted spaces of leisure and beauty, such as parks and gardens, to give their works a sense of nostalgic distance, Weir's treatment of these modernizing elements aestheticizes them as part of an exciting, evolving national landscape. Weir uses the powerful red tone of the bridge to contrast the structure's industrial geometric structure with the softer organic curves that surround it. Combining opposites to achieve a sense of harmony, Weir reveals the influence of Japanese woodblock prints. Japanese art had been critical to the development of Impressionism and Weir was perhaps the most astute American interpreter of this influence. The compositional space is flattened by the high horizon and the cropping, which reduces some of the trees and branches to geometric fragments. This creates a more daring modernist arrangement, one that approaches abstraction in the water's reflection. Painted in the year of the Armory Show, which introduced 20th-century modernism to American audiences, this painting is evidence of the continued life of American Impressionism into the 20th century. Far from its radical roots, it became a style associated with genteel calm and upper-class patrons, particularly as executed by Childe Hassam. Deeply influenced by Monet and his 1880s paintings of the northern coast of France, Hassam depicts a stretch of tumultuous, churning water and rocky coast. It was a distant cry from his city scenes and quiet interiors, yet this escape into the wilderness has been aestheticized through pleasant contrasts of oranges and purples and delicate brushwork. The site was deeply familiar to the artist; Hassam produced approximately 10% of his works at the Isles of Shoals, an artist colony off the coasts of Maine and New Hampshire. 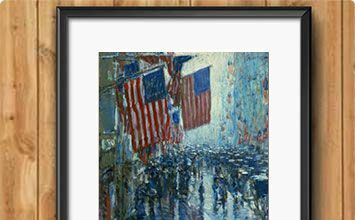 Like other Impressionists, Hassam was influenced by Japanese woodblock prints, as can be seen in the high horizon line and flattened pictorial depth. The interwoven brushstroke adds another level of flatness, emphasizing the two-dimensionality of the canvas; the result inches towards the abstract canvases of emerging modernist movements. Hassam sits at the intersection of two centuries: the inheritor of 19th-century Impressionist experiments with color and light, and the 20th-century abstractionists who began to liberate these formal qualities from concrete subject matter.